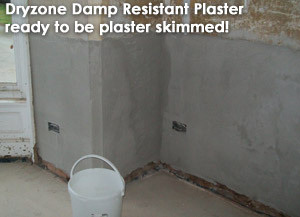 As a natural extension to our damp proofing work we also offer a range of plastering services. This means that we can leave your premises completely finished and ready for decorating! Our highly skilled plasterers only use the best quality materials which in turn provides a long lasting, quality finish. We pride ourselves on being punctual, clean and reliable and completing our work to high standards. although we are not a plastering company per se, we approach each individual job as if it were our own property. Our goal is simple; to leave you, the customer, feeling completely satisfied with the quality of workmanship and having no reservations in recommending our company to your friends and family. 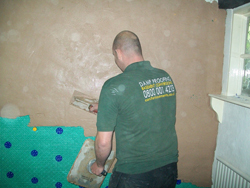 We undertake many types of plastering and skimming work as part of our damp proofing projects around Chester, Cheshire, Shrewsbury, Telford, Oswestry, Shropshire, Welshpool, Wrexham, Clwyd, Powys, Gwynedd, Aberystwyth, Ceredigion, Mid Wales, North Wales and often all over the UK. 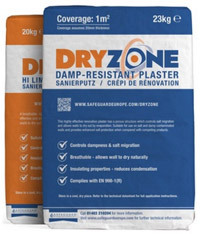 As part of the injection damp proofing system, the new Dryzone Damp Resistant Plaster is a major innovation. After the injection process is complete, walls may be plastered with this new product which is resistant to damp and hydroscopic sulphates (water-borne salts). This may be used instead of water-proof renders but what is truly innovative is the fact that the Dryzone Plaster is breathable. For this reason it has been approved for Heritage applications and is ideal for old buildings. Another thing that makes this product stand out is that it can be covered with pretty much any standard plaster such as Thistle Multifinish, so no specialist finishes are required. Decorating can take place in as little time as a fortnight which is quicker than most render applications. Simply make one call to Conifer now and leave the rest to us! We look forward to hearing from you.